• Parts of Europe and Asia including China will see more acidification in their environment in the coming years. •Agricultural land will expand from approximately 37 per cent of the total land area presently to around 50 per cent by 2050. The highest increases are projected to take place in Africa and West Asia. 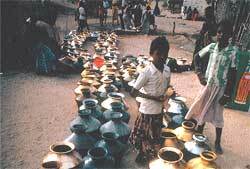 •The total global water demand will grow substantially from 3,000 km 3 in 1990 to 4,300 km 3 in 2050. •Life expectancy is expected to reach a global average of just over 70 years by 2050 compared with 75 years or more today in developed countries. •The future years could foresee a population that is on average wealthier and in better health, but living in a world with scarcer resources. •With the world economy increasing maybe five-fold and the need to reduce environmental pressures by at least by a factor of two for many problems, the efficiency of resource use should be increased ten-fold globally in the coming half-century. • The interlinkages between different environmental problems have to be taken into consideration. Our analysis, for example, demonstrates how issues of food security, climate change and biodiversity are closely connected, for instance, through land use and land cover implications. Therefore, integrated policies have to be designed in addition to policies that address only one issue at a time. This implies a balanced attention to economic, social and environment issues so the interconnectedness of the various complex socio-economic and environmental issues is recognised. • It is crucial to take into account regional differences and priorities as our analysis clearly shows that the environmental impacts of socio-economic developments are very different across regions. In the industrialised temperate and boreal zones in the northern hemisphere the mitigation of environmental pressures through the excessive use of materials and energy deserve high priority. Anticipatory action is also required as largescale environmental changes can lead to (adverse) impacts with considerable delay. • Finally, for decreasing environmental pressure under conditions of rapid growth of population and production and consumption, rapid but sustainable increases in the intensity of resource use are essential components of any sustainable development policy portfolio. The cd scenario assumes that total environmental pressure (emissions, land conversions) continues to build up. It has been suggested that, with a world economy increasing maybe five-fold and the need to reduce environmental pressures by at least by a factor of two for many problems, the efficiency of resource use generally should be increased ten-fold globally in the coming half-century. This can be achieved not only by technological developments, but also by dematerialisation of lifestyles.